Relieve a thirsty complexion with the Vichy Quenching Mineral Mask, an intensive dose of lightweight hydration for dehydrated skin types. 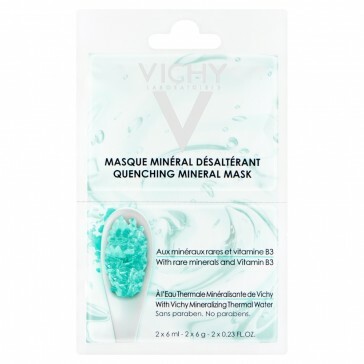 Enriched with intensely hydrating glycerin, the Vichy Quenching Mineral Mask works to provide your skin with an instant injection of productive moisture. Vitamin B3 helps your complexion to maintain a healthy condition, while Vichy’s mineralizing thermal water soothes and hydrates your complexion to reveal a smooth and supple texture. The Quenching Mineral Mask is enhanced with a cooling water-like texture, plus an infusion of jasmine water, bamboo and green tea to lightly scent your skin. Your complexion feels soft and your senses are calmed after every use. Use 2 - 3 times a week. Apply to clean skin, leave for 5 minutes and do not rinse. Avoid the eye and lip areas.